Derek McInnes’ hangover cure following last Thursday’s European exit was to change nearly half his outfield players. The Aberdeen manager watched as his freshened-up side handled domestic chores in far less balmy conditions than Cyprus. But Aberdeen took their time to seal victory against a side reduced to ten men for the last 30 minutes after Xavier Tomas’ red card. It was not until substitute Miles Storey’s curled 90th minute effort that the home side could be certain the points were theirs. Anthony O’Connor, one of those asked to pull their boots back on after the European disappointment, gave Aberdeen a first-half lead with a cushioned header. But try as they might, and they did, spurning several chances, the home team could not feel entirely comfortable until the dying moments. But he’ll need to have 11 men on the pitch for the entire 90 minutes – or more – in the cup tie. Centre-half Tomas was sent off on this league debut for Hamilton, booked twice within eight second-half minutes for fouls on Ryan Christie. Hamilton were at their street fighting best in the early stages, enraging the home fans with what they complained were strong-arm tactics when often it was simply a case of superior muscle. But the away side were guilty of some later, less wise challenges, with Tomas reaping the bleak harvest of a red card. Canning complained that Aberdeen’s Graeme Shinnie, for example, had got away with worse. But on the back of five bookings – four of their back five were cautioned – the Hamilton manager probably knew there was always the potential for a red card, which is what unfolded. The visitors set out their stall from the start. Referee Euan Anderson waved away loud Aberdeen appeals for a penalty when Tomas seemed to clash with Scott Wright just inside the box. It wasn’t, in theory, the kind of game for the talents of the more lightweight Wright, one of the four changes made by McInnes. Dumped on to the turf by a strong Ioannis Skondras challenge, the 19 year-old picked himself up and tested Woods with a fierce drive after a quick Aberdeen break. Aberdeen were already ahead by then, O’Connor steering Greg Tansey’s free-kick towards the far post with a well-directed, deft header. It resembled Christie’s header into the same goal against NK Siroki Brijeg in Aberdeen’s first European qualifier last month. Christie and Wright were working well together, with the latter showing some excellent touches to skip away from those Hamilton defenders intent on stopping him, be it through fair means or foul. But Hamilton are always capable of landing a sucker punch and they almost did a couple of times before the break. 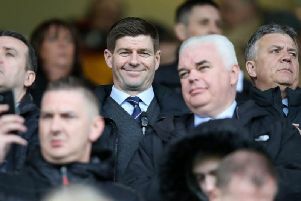 Steven Boyd should have burst the net from close in after Greg Docherty’s excellent cross, with the latter player also seeing a long range shot tipped over by Joe Lewis on the stroke of half-time. Hamilton earned a 1-1 draw at Ibrox on the opening day last term but hopes of salvaging something from this afternoon receded when Tomas was red carded for his second bookable offence, a tug on Christie. But Aberdeen, for all their pressure, were not able to completely extinguish the challenge of the visitors. Hamilton’s ambitions of getting back into the game could not be completely discounted until Storey’s intervention. Sent on for Nicky Maynard after 86 minutes, and previously something of a forgotten man of Pittodrie, the striker advanced to the corner of the box after receiving the ball from Shinnie before placing a shot just inside Woods’ far post.